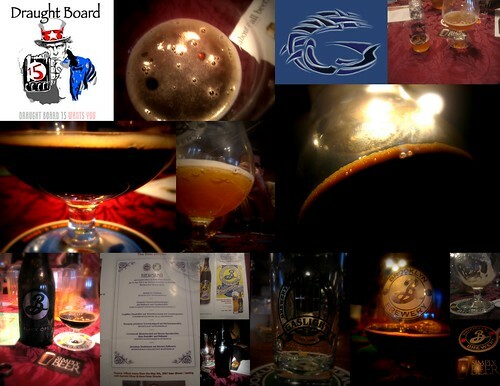 The last meeting of the Draught Board 15 at the Gaslight was a very good one. It was a little different this month due to Mothers Day. The DB15 regularly meets on the second Sunday of the month. It was a nice relaxed session on a pleasant Sunday Afternoon and a great day for a casual lightly structured tutored tasting of beers with Brooklyn Brewery’s representative, Mike Ferry. Less people showed up than usual, but it was just enough. The meeting was very informative. •	Local 1 , it had Tobacco in the nose, but did not smell bad, very nice, interesting taste, gold color, it uses a blend of barley malt and hops from Germany, aromatic raw sugar from Mauritius and Belgian yeast. •	Local 2, had a Nice Nose, slight chocolate one tongue, a Belgian-inspired bottle-conditioned strong dark abbey ale, with sweet orange peel and raw wildflower honey from a local family apiary. •	Brooklyn Dark Matter, my Favorite of the day, I did not want to drink it at first, I just wanted to smell it, so awesome. It was too cold at first. Dark Matter gave up chocolate right away, as it warmed Caramel/Vanilla, found it way out like lost warriors coming home from war Glorious. Brown ale aged in Woodford Reserve Bourbon barrels. Not available, (but absolutely should be) This is one of the few beer I’ve had that I consider Epic, Something I would enjoy with a nice Thick Graphic Novel , or defiantly share with Friends to have very deep conversations about nothing. Brooklyn Brewery was started in 1987 by former Associated Press correspondent Steve Hindy and former Chemical Bank lending officer Tom Potter. Hindy learned to brew beer during a six year stay in various Middle Eastern nations such as Saudi Arabia and Syria, where possession and consumption of alcoholic beverages were forbidden. Upon his return to his home to Brooklyn in 1984, he and Potter, his downstairs neighbor, quit their jobs and founded the brewery.